Quality Lock is Pittsburgh’s most trusted 24-hour mobile locksmith and safecracker. Located in the greater Pittsburgh region, family-owned Quality Lock has set the standard for reliable, affordable, professional locksmith services and GSA certified safe expertise for more than 25 years. We are the Steel City’s established standard of excellence whether you call on us for 24-hour emergency service at your home or business, or when you need the absolute best safe and vault technician in Pittsburgh. Since 1989, Quality Lock has responded to more than 15,000 service calls throughout western Pennsylvania and select West Virginia and Ohio areas, establishing a rock-solid reputation as one of the region’s top full-service locksmith companies. We are dedicated to customer satisfaction in every phase of workmanship, from basic lock repair, to high-tech safe installation, to all manner of 24-hour emergency locksmith services. From our perspective, a home lock installation carries the same importance as repairing and inspecting high security safes at a large business. And this dedication to excellence shows in each and every job we complete. 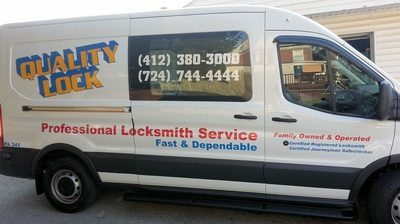 Quality Lock is a mobile locksmith, providing Pittsburgh, Monroeville and Trafford Township residents with 24-hour emergency locksmith services. If you need immediate service, call Quality Lock first to ensure the work is performed by a highly-trained, certified, professional locksmith. We are a local, family-owned and operated locksmith, as well as longtime residents of the Pittsburgh community. When you call Quality Locksmith, you can be confident that we will are here to resolve all your locksmith and safe needs, today and into the future. Quality Lock is a proud member of Associated Locksmiths of America (ALOA), Safe and Vault Technicians Association (SAVTA), and the ClearStar Security Newtwork. We accept all major credit cards and are on call day or night to solve your emergency locksmith needs or discuss any security questions or problems you have. Quality Lock in Trafford PA is a certified provider of residential and commercial locksmith services, as well as a wide range of safe and vault opening services. We offer all of our services at affordable, up-front prices, 24-hours a day/seven days a week. Our mobile technicians offer rapid response to all locksmith needs. Call Quality Lock for lock repair in Trafford PA, Door Closer Repair Trafford PA, and Door Closer Replacement Trafford PA.
Quality Lock is western Pennsylvania’s premier safe locksmith. Put simply, Quality Locksmith knows safes and vaults better than any other local, and most national, locksmiths. Our certification, ongoing intensive training, and hands-on experience with safes off all brands and types set us apart from the competition; our reliability and affordability has earned us the reputations as Pittsburgh’s first choice for safe, vault, and container locksmith service. Quality Lock is a licensed, insured, verified, and honest commercial mobile locksmith in Trafford PA 15085. 1800unlocks.com is a professional locksmith directory. Quality Lock is also a Safe & Vault Locksmith. When you need safes unlocked, safes repaired, safes moved, or safe combination changed, call Quality Lock a mobile locksmith in Trafford PA 15085.